In October of 2009, Travel Dynamics International will undertake a strikingly original cruise called Remarkable Women of Antiquity and their Times. 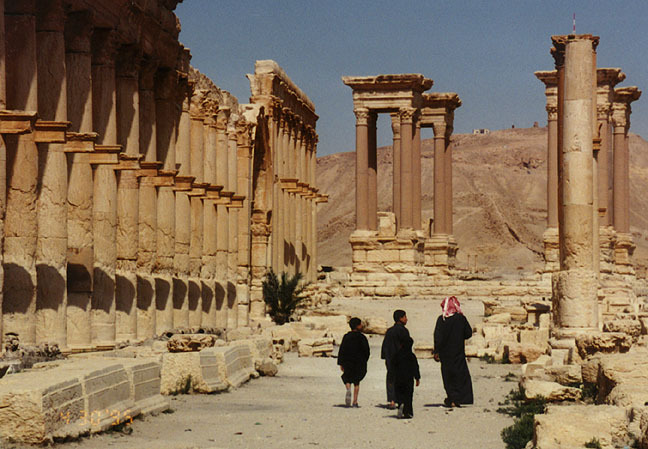 In it, we’ll be traveling into Syria, to the splendid ruins of Palmyra, to have a look at the reign of Queen Zenobia. Shame on you. Clearly you’ve not recently delved into Gibbon’s Decline and Fall of the Roman Empire. Granted, not many of us these days have time for a ramble through a three-volume, 2700-page epic filled with lots of obscure names, arch diction, and an occasionally tedious rendering of centuries of appalling, unmitigated slaughter. But, hey, that’s what we at the TDI blog are here for. Here are the tasty bits for your robust historical delectation, to whet your wanderlust. Here’s the story of Palmyra and Queen Zenobia, which takes place in the middle of the 3rd century A.D. It’s pretty good prose, right? Amid the barren deserts of Arabia a few cultivated spots rise like islands out of the sandy ocean. Even the name of…Palmyra, by its signification in the Syriac as well as in the Latin language, denoted the multitude of palm-trees which afforded shade and verdure to that temperate region. The air was pure, and the soil, watered by some invaluable springs, was capable of producing fruits as well as corn. A place possessed of such singular advantages, and situated at a convenient distance between the Gulf of Persia and the Mediterranean, was soon frequented by the caravans which conveyed to the nations of Europe a considerable part of the rich commodities of India. Palmyra insensibly increased into an opulent and independent city, and, connecting the Roman and the Parthian monarchies by the mutual benefits of commerce, was suffered to observe an humble neutrality, till at length, after the victories of Trajan, the little republic sunk into the bosom of Rome, and flourished more than one hundred and fifty years in the subordinate though honourable rank of a colony. It was during that peaceful period, if we may judge by a few remaining inscriptions, that the wealthy Palmyrenians constructed those temples, palaces, and porticos of Grecian architecture, whose ruins, scattered over an extent of several miles, have deserved the curiosity of our travellers. The elevation of Odenahus and Zenobia appeared to reflect new splendour on their country, and Palmyra, for a while, stood forth the rival of Rome; but the competition was fatal, and ages of prosperity were sacrificed to a moment of glory. Continue below the fold to read The Grand Yet Lamentable History of Queen Zenobia, who defied the powerfully potent purple-garbed panache of the Roman Emperor Aurelian. Note, this is Edward Gibbon we’re talking about here, who’s a man, and Englishman, and a 19th-century Englishman to boot. So we earnestly entreat you to read any perceived sexist, classist, racial, nationalistic, or any other presumptions as the author’s and NOT our own. Hey. Give him a break. He’s just a man. TDI Presents "Antiques Roadshow" Cruises!